This article first appeared on East Niagara Post on December 9, 2014. It is repeated here as I work to put all my book reviews in one place. They will be posted on Thursdays or Fridays and only be altered from the original in that I will add publisher information and pages. Hopefully, by revisiting these reviews, other people might find a book they'd like to pick up for their own enjoyment. Good science fiction is the type that is advanced far enough to fit the genre, yet close enough to reality that you truly believe that it could happen. There is no magic or deus ex machina. Everything can be proven through science, even if it is extrapolated from theoretical science. Thankfully, it won’t enter the realm of dwarfs, fairies or pixies. The Boost, by Stephen Baker, is great science-fiction. 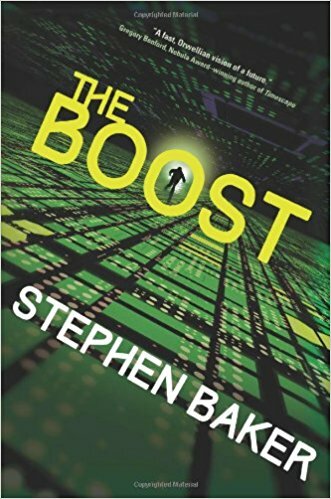 Set in the very near future when Google has evolved into more than a simple search engine, The Boost, showcases a data driven society completely reliant upon chips implanted by the government. These chips allow the user to download facts, fun and virtual worlds directly into their brains. The latest chip was developed by the Chinese and is due for an upgrade when Ralf, our protagonist, discovers that there is a security loophole. When he brings it up to his governmental superiors, his whole world gets ripped apart. Ralf has his implant removed, becoming one of the “wilds.” Without his implant, he feels lost. He can’t just download the latest news, or access many of his own memories. At the same time, he is no longer able to be tracked by anyone. He can move around the country like a ghost. It gives his a new freedom to track down the reasons for allowing the Chinese to peer into the head of Americans everywhere. While searching for these answers, Ralf discovers the truth behind his family’s secrets and finds love in the strangest of places. As the story unfolds, he also learns that being unwired is not as bad as it seems. After going through withdrawal, Ralf starts to see the positive to becoming a “wild.” In the end, what they’ve learned is to balance their virtual worlds with the real one right in front of their faces. This future is not very far away. It is just over the horizon and coming fast. This story showcases the idea that our society is all too ready to sacrifice privacy in the name of “progress.” It shows us the inherent dangers in allowing all our personal information open for the world to see. Baker weaves this tale with great aplomb. Set so near into the future, many of the scenes will feel very familiar to many readers. However, gone are PCs, laptops, ipods, etc. Who needs that antiquated technology when you can download your entire playlist to your head? Baker’s characters struggle with the loss of this technology that they’ve grown so accustomed to having at their fingertips. Just think about your own lives when your internet is down or the power is out. These characters are brought together with a common goal of saving their own lives from the very technology they invented to make their lives better. Baker understands the technological evolution and replays that information to us with extremely realistic terms. I am not a Luddite. I love some of the technology out there that can bring entertainment directly to us anytime we want. At the same time, a lot of this technology can be very invasive. Stephen Baker details the dangers of what could happen if we allow all idea of individuality and privacy to be subverted as a means to be even more entertained. I really liked this novel and hope to read other works by Stephen Baker. I bet many of you will enjoy it also, even if you’re reading it digitally. Craig Bacon wants a holodeck like on Star Trek. As long as he doesn't need an implant.